But the 2006 law came with no explicit funding. A spending bill for the Department of Homeland Security passed that year did include $1.2 billion for “fencing, infrastructure, and technology,” though. Also, the expected cost wasn’t close to $50 billion. Although the Congressional Budget Office didn’t estimate the cost of the Secure Fence Act of 2006, the agency did estimate the cost, per mile, of fencing proposed in another bill that same year. The CBO projected that it would cost about $3 million per mile for fencing along the southern border. That would put the total estimated cost of 700 miles of fencing at about $2.1 billion in 2006. And that’s close to what the government ended up spending to construct more than 500 miles of fence along with roads and other infrastructure, according to a recent report from the Government Accountability Office. Between fiscal years 2007 and 2015, the government had spent $2.4 billion to expand the total miles of fencing on the southwest border from 119 miles to 654 miles. 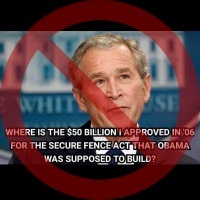 So, contrary to what the meme suggests, the fence project was completed and didn’t cost close to $50 billion. “Congress Must Do More to Address The Border Crisis.” Fact Sheet. White House. 8 Jan 2019. Congressional Research Service. “U.S. International Borders: Brief Facts.” 9 Nov 2006. “Senate Approves Hutchison Border Fence Amendment.” Press release. Sen. Kay Bailey Hutchison. 26 Jul 2007. Department of Homeland Security. Office of Inspector General. “Progress in Addressing Secure Border Initiative Operational Requirements and Constructing the Southwest Border Fence.” 15 Apr 2009. Trump, Donald. Remarks on border security. James S. Brady Press Briefing Room. 3 Jan 2019. U.S. Government Accountability Office. “Southwest Border Security: Additional Actions Needed to Better Assess Fencing’s Contributions to Operations and Provide Guidance for Identifying Capability Gaps.” GPO, 2017. Congressional Budget Office. Cost Estimate — Comprehensive Immigration Reform Act of 2006. 18 Aug 2006.